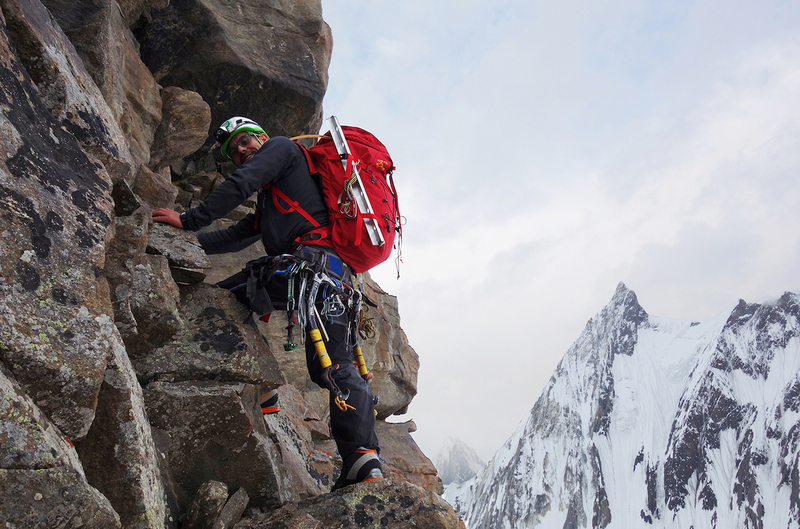 Three Chilean climbers—Andres Bosch, 29, Armando Montero, 36, and Alejandro "Jimmy" Mora, 39—set out for the Karakoram Range in mid-June to explore some unclimbed peaks directly across the Godwin-Austen Glacier from Broad Peak. 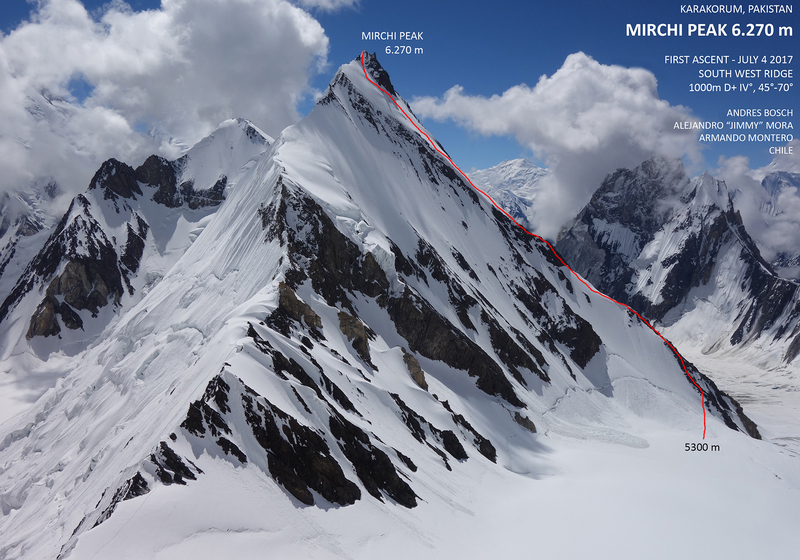 On their first trip to Pakistan, over a nine-day period, they made the first ascent of a 6270-meter peak, which they dubbed Mirchi (D+, IV, 45-70�, 1000m), after the Urdu word for "chili," and Bosh and Mora then made the first ascent (TD+ M3, 50-90�, 1500m) of Praqpa Ri South (7046m). Nancy Hansen and Ralf Dujmovits attempted Praqpa Ri last year, approaching it from the Savoia Glacier on the north side. They were turned around at 6300 meters because of dangerous snow conditions. Hansen noted in the American Alpine Journal that a better approach for the mountain would be from the Khalkhal Glacier on the south side. The Chilean team heeded her advice and followed the Khalkhal Glacier from Broad Peak's base camp after doing some reconnaissance. They set up Camp 1 at a col on the south ridge of Praqpa Ri at 5600 meters, where an unnamed 6000-meter peak—which they'd investigated on Google Earth—provided an enticing goal to the east that would help the men acclimatize. During the approach, we saw a nice rocky-snowy ridge leading directly to the summit of our peak, so we decided to climb it. We set up our tent in a very good spot in the col, and we rested one day before our push for the summit. Finally, at 3 a.m. on June 30, we left our tent.... 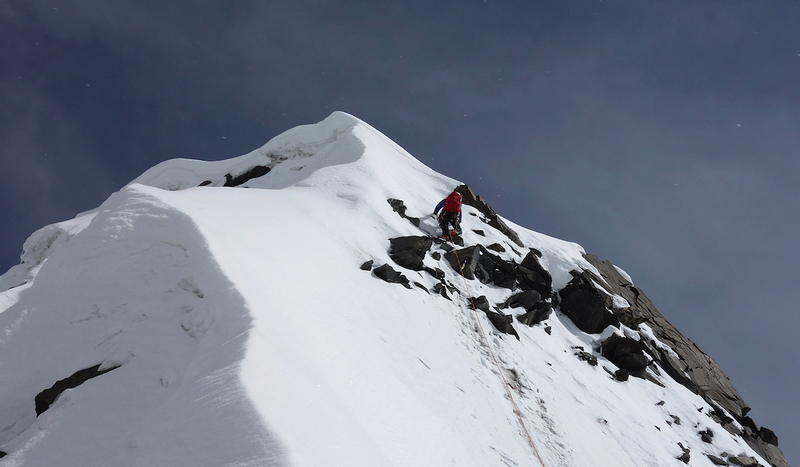 The climb started descending 300 meters from the col to reach the ridge at approximately 5300 meters. The first part of the route was mainly rock climbing up to [Class] IV. 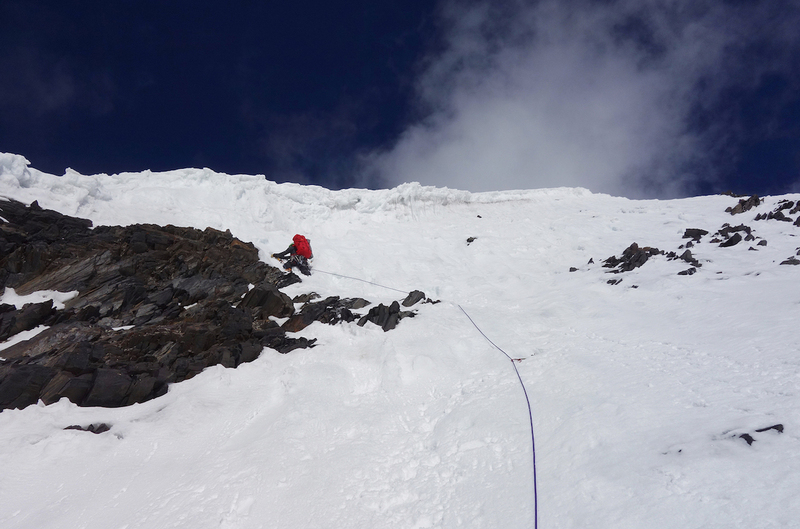 After 500 meters we put on our crampons and we climbed through a snow ramp with an inclination of 45-60�, which ended in a small col just 40 meters below the summit. After climbing the last pitch (ice climbing, approximately 70�) we topped out the peak, reaching the snowy summit after 12 hours of climbing from the base. The altitude of the main summit was 6270 meters and it was located beside a lower rocky point. After taking some pictures, we started to descend as quickly as possible since the weather had been unstable during the whole day. After some rappels and downclimbing most of the route, we came to the glacier late at night. Once on the glacier, we decided to keep going down towards the base camp, which we reached in the morning of the next day. After Mirchi Peak, Montero had to leave the expedition. Mora and Bosch continued on toward their primary goal of Praqpa Ri, which has three summits—southeast, middle and northwest. 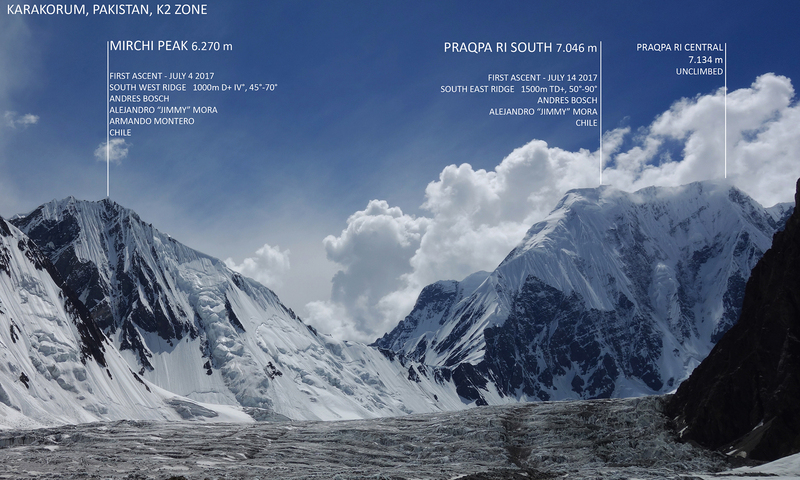 Hansen's AAJ report lists the respective elevations at 7026, 7156 and 7058 meters, but Mora and Bosch's GPS indicated 7046 meters when they summited the southern peak on July 16. After resting some days at base camp, we received a good weather forecast so we decided to attempt Praqpa Ri. With heavy backpacks, we headed up to the col (Camp 1), reaching it on July 12 after two days of walking along the glacier.... After one day of resting at Camp 1, we started to climb the south ridge from the col at 4 a.m. at July 14. 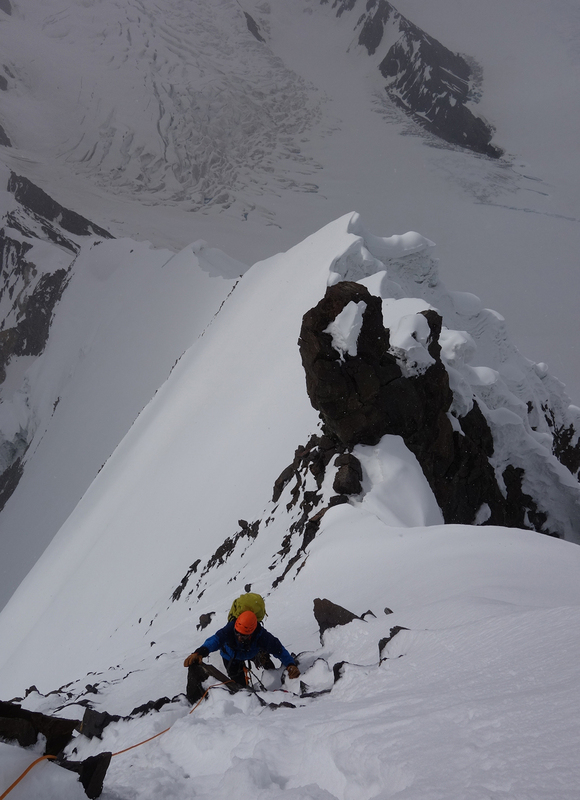 The first part of the route was a short M3 pitch followed by 300 meters of snowfields (approximately 50-70�) with three rimayes of 90� with inconsistent snow that were climbed on the left side. Fortunately, sometimes we found ice under the snow so it was possible to place ice screws. After overcoming the rimayes, we climbed other 300 meters on good ice of 60�-70� that ended in an exposed and sharp ridge that was reached, climbing also to the left to avoid an overhanging rimaye at the end of the ice ramp. The deep snow of this ridge made our ascent very slow, and after a couple of hours fighting with the bad snow conditions, at 8 p.m. we got a very nice spot to set up the tent under a big serac (Camp 2), after a first day climbing 10 pitches and simulclimbing the rest of the route. This nice spot at the end of the ridge was the first and only appropriate place we could find for our ultralight tent during this 16-hour climbing day. They rested through the next day and set out for the summit at 11:30 p.m. This second climbing day was less technical than the previous one, but the altitude made it especially difficult for the deep snow that slowed down our advance. From Camp 2 we traversed to the left for about 50 meters and afterwards we climbed straight up for another 150 meters, where we found a small plateau (nice place for a tent), which was traversed again to the left. 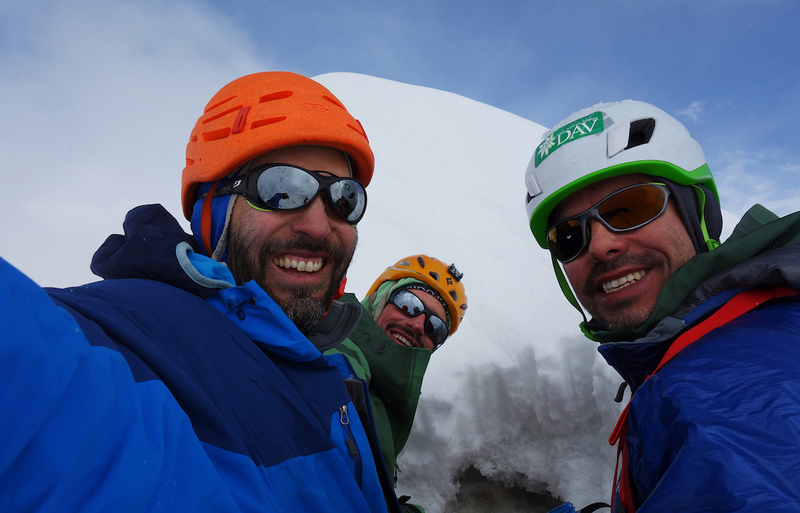 After climbing another ridge, we climbed the last part of the route, which was a very long 50� ramp of deep snow.... 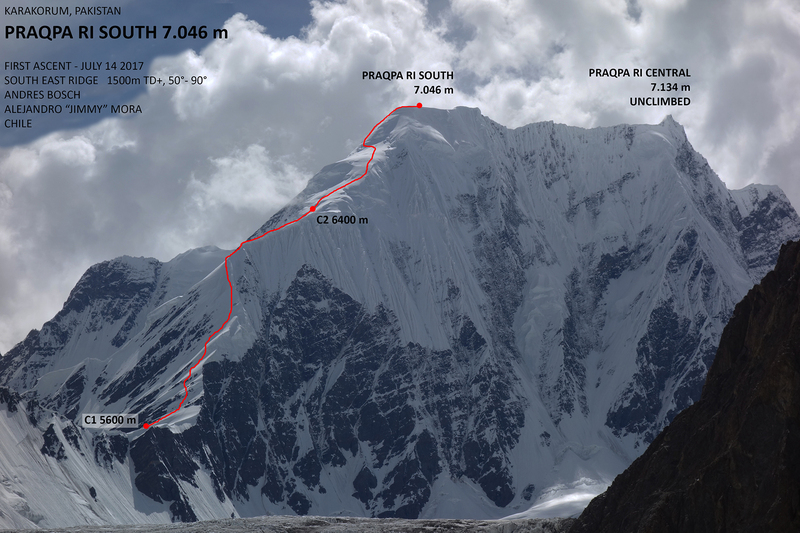 Finally after 10 hours of avoiding seracs and crevasses, we topped out the south summit of Praqpa Ri at 10 a.m. July 16, with our GPS showing an altitude of 7046 meters. The weather was deteriorating by the time we reached the summit, so after one hour enjoying the view, we descended to Camp 2 following our footprints but covered by clouds. 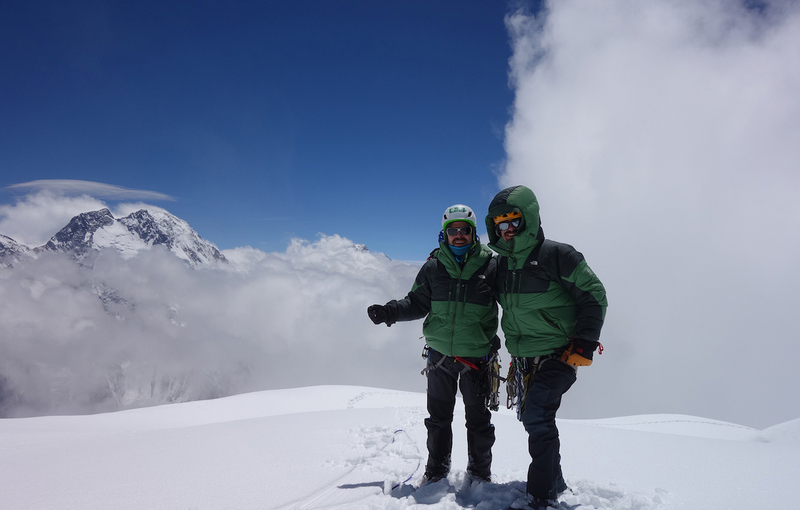 The next morning, the bad visibility from the cloudy weather impeded our descent to Camp 1. After one day stuck at Camp 2 we could come down to Camp 1 only the next morning during a short window of good weather. 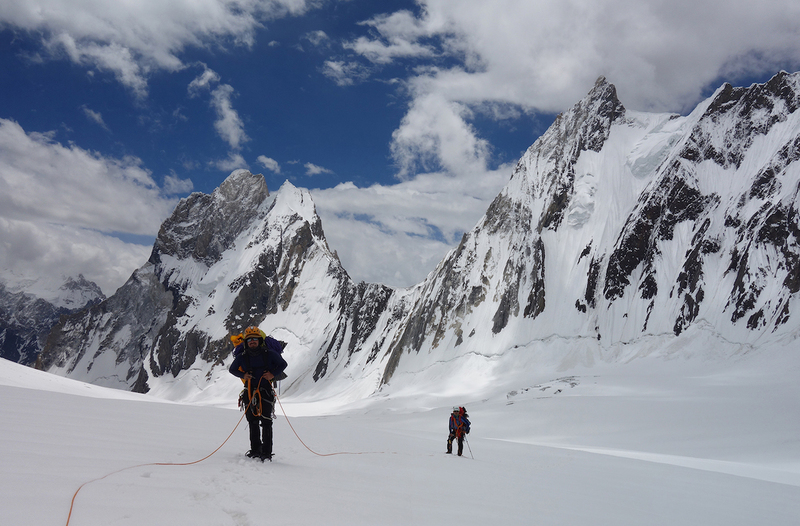 Our trip ended when we reached Broad Peak base camp July 19 after nine days in the mountains. I read that Mirchi Peak were climbed earlier by two Dutch alpinists: Gerard van Sprang and Ronald Naar in 1984. The source of this info is "The Alpinist Journal".